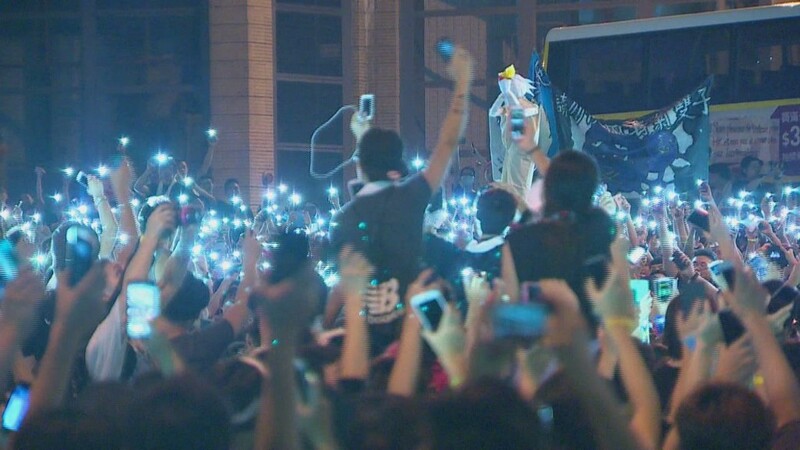 How far are Hong Kong residents willing to go in their stand for democracy? For Jennifer Moberg, the answer is nearly 3,000 miles. After hearing from friends that pro-democracy protests in the city were escalating and that police were using tear gas on protesters, she immediately decided to return from Afghanistan, where she is working as a music teacher. "The crazy part about that is that Sunday was also the inauguration of Afghanistan's new president," Moberg said. "I just couldn't understand how I could be in one of the most dangerous countries on the planet, watching a peaceful transfer of power, while at the same time, Hong Kong -- one of the most peaceful, stable, organized places in the world -- was in protest," she said. "At that point, I thought -- well, I have to come back." Moberg lobbied for a few days off from work, and flew out the following day to join other Hong Kongers on the streets. "I want to vote [in Hong Kong]," she said. "[We should] be able to pick our own leader." Hong Kong resident Jennifer Moberg took time off work in Afghanistan to join the protests. Hong Kong's pro-democracy movement exploded last weekend as huge crowds of students flooded the city's main business district, and blocked several key arteries in the city. Heavy-handed police action against them Sunday brought even more people into the streets. Protesters want free and open elections, while Beijing has proposed a system that will allow it to basically screen candidates for the city's top office. Moberg, 34, a violin teacher, moved to Hong Kong from the U.S. nearly nine years ago. She has since founded a music academy in the city, and received her permanent residency, which allows her to live and work here without a temporary visa. Last month, she started a year-long stint teaching at the only music school in Afghanistan. 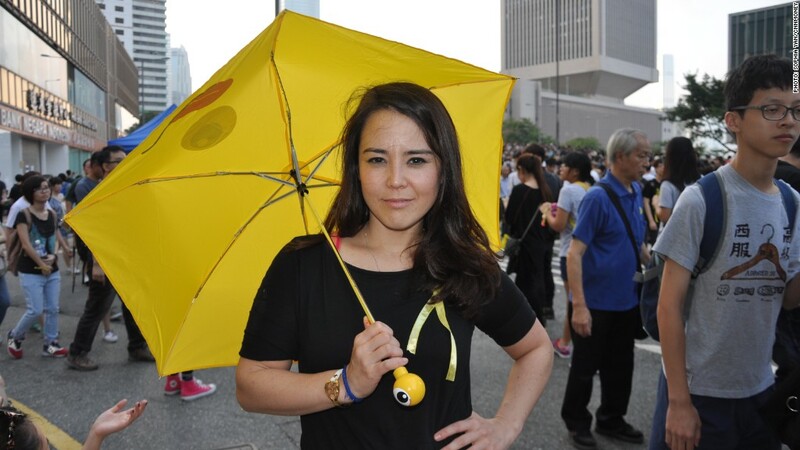 Moberg landed in Hong Kong late Wednesday morning and was out on the streets within a few hours, wearing yellow pants and twirling a yellow umbrella in a show of solidarity. The umbrella has quickly become a protest symbol after students used them to protect against pepper spray and tear gas. It wasn't long before Moberg added yellow ribbons to her ensemble, and began chatting with other supporters while handing out protest stickers. "I'm flabbergasted ... here are the students handing out crackers; this guy is handing out fans; he's handing out water; there's a first aid tent over there," she said. "A girl walked by carrying a sign saying, 'Need translation? I can help.' "
Moberg marveled at the fact that she could walk down empty stretches of Hong Kong's main thoroughfares, which are normally packed bumper-to-bumper with traffic. She said that securing true universal suffrage is the most important protest goal, but also expressed concern about Hong Kong's wealth gap and rising property prices. In recent years, a wave of buyers from mainland China have pushed home prices to extreme levels. "There is a huge gap between the rich and the poor -- only wealthy people can buy a home," Moberg said. "It's not that poor people can't, it's also that regular [middle class] people can't -- it's hard to keep this place as your home if you can't own a part of it." The contrast to Afghanistan was stunning, she said. In Kabul, she can't get groceries without protection; in Hong Kong, it's the total opposite -- "anything goes." "They have democracy, but not safety; here we have safety, but no democracy," she said. Although she is American by birth, Moberg now considers Hong Kong her home, and is proud of the freedom the city allows. "Here is a place where you can be anything you want to be; there is no stigma attached to what you believe," she said. "As soon as I arrived here, I knew that this was the place for me."